Ferienwohnungen Rahm Ferienwohnungen Rahm offers apartments with a balcony and mountain views, located in Mayrhofen, 2 km from the Penkenbahn Cable Car. Each unit at Ferienwohnungen Rahm also comes with a flat-screen satellite TV, a kitchen or kitchenette, a safety deposit box and a bathroom with shower or bath tub. Chalet - Apartments Julitta Oberhollenzer price per day from € 75 Panoramic views of the Zillertal Alps are provided at Oberhollenzer, enjoying a central location in Mayrhofen. All comprise a living area, a kitchen or a kitchenette with a fridge and a bathroom with a shower or a bathtub. A ski bus stop is reachable within 1 minute on foot..
Apart Hotel Garni Therese price per day from € 50 Enjoying a quiet location in the heart of the Zillertal Alps, Apart Hotel Garni Therese is only a 10-minute walk from the centre of Mayrhofen. The rooms and apartments have a flat-screen cable TV and a bathroom with slippers. For stays longer than 7 nights, the rooms will be cleaned once free of charge..
Appartements Mair price per day from € 60 Appartements Mair is located in a quiet area, 5 minutes’ walk to the Mayrhofen Ski Resort base station. In good snow conditions, it is possible to start cross country skiing from Appartments Mair. A seating area with cable TV are provided in every apartment and the private bathroom is fitted with a bath or shower..
Alpin Hotel Garni Eder Mayrhofen’s Alpin Hotel Garni Eder is situated 400 metres from Penkenbahn and Ahornbahn ski areas and offers modern, Alpine-style rooms with Zillertal Valley views. The adventure centre in Mayrhofen offers indoor and outdoor pools, slides, saunas and a sun bed, and is 250 metres away. 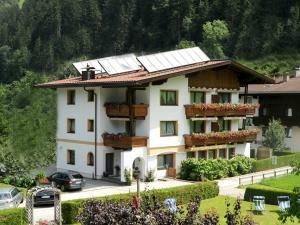 Appartement G Hochmuth price per day from € 65 Appartement G Hochmuth in Mayrhofen enjoys a quiet location on the edge of the wood, 100 metres from the Penkenbahn and Ahornbahn Cable Cars. The modern, Tyrolean-style apartments offer mountain views from the balcony or terrace. A private bathroom with a bath and an additional toilet are provided. Gästehaus Huber Quietly located in Mayrhofen, Gästehaus Huber features apartments with a balcony and cable TV. Each apartment, renovated in autumn 2013, is equipped with a kitchenette, a fridge and a bathroom with a tub and a hairdryer. On request, you can use Huber's Boutique Hotel’s spa area, which can be reached within a 7-minute walk. Landhaus Sabrina price per day from € 48 Landhaus Sabrina enjoys a quiet location in Mayrhofen-Burgstall, just 100 metres from the ski bus stop for the Zillertal 3000 Ski Area, and offers you an apartment with fully equipped kitchen and mountain-view balcony. You can park your car free of charge on site and store ski equipment in the garage. A supermarket and a bakery can be found in the centre of Mayrhofen, 1 km away..
7. Take exit 39-Wiesing for B181 toward Achensee/Zillertal. 8. At the roundabout, take the 2nd exit onto Achensee Str.181. 11. Turn left onto Einfahrt Mitte. Ski resort Alpbach, number of ski pistes: 65. 26 km from town of Mayrhofen. Ski resort Angerberg, excellent nightlife, many restaurants and pubs. 40 km from town of Mayrhofen. Ski resort Achenkirch, downhill pistes: 25km. 42 km from town of Mayrhofen.